In a previous post I talked about how I feed my rats. That covers their everyday food, and how I make sure they get a balanced diet. However, one thing I didn’t talk about is treats. Rats love food. It’s a source not only of calories and nutrients, but also fun and interest. Used creatively for foraging and puzzle-solving, food is a great way to keep your rats entertained. So, giving them occasional food treats is a great way to bond with our rats and keep them engaged. However, it’s important to avoid overfeeding rats – just like humans, if they eat too much they can develop obesity and health problems. 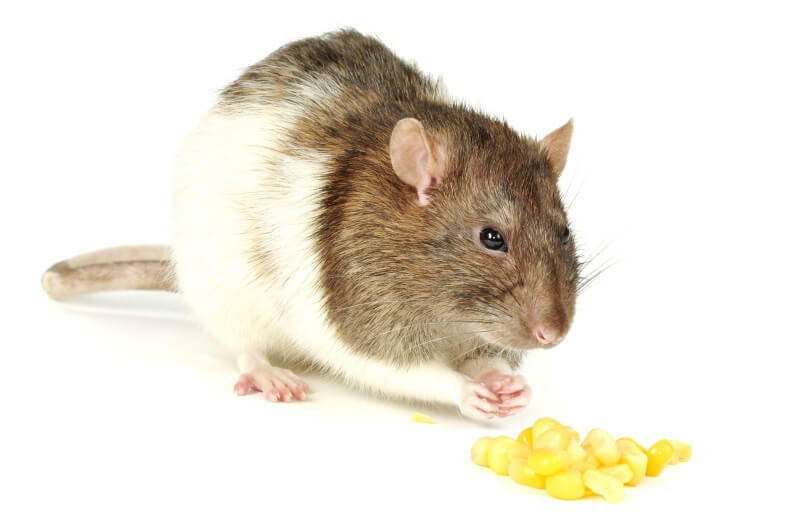 It’s also important to feed them the right sort of foods – high sugar, high salt and high fat foods are no better for rats than they are for us. What is a treat to a rat? Rats and humans have a different relationship to food. To put it simply, while rats love food and will overeat given the chance, they don’t have the complex relationships with food that humans do. Humans tend to put labels on food like “good”, “bad”, “healthy”, “sinful”, “naughty”, “indulgent”. Our idea of a treat is usually something that we “shouldn’t” eat, or at least a food that shouldn’t be eaten very often, like cake, chocolate, or fast food. It’s a treat to us because it’s something we can’t have on a day to day basis. Rats don’t see food like that. Rats label food by “thing I want to eat”, or “thing I really want to eat because my friend is eating it”. They like unhealthy foods because like most animals they are hard-wired to maximise their calorie intake, but they don’t have a psychological need for them, and won’t feel deprived if they never get them. That means that to a rat a treat isn’t something naughty or indulgent, it’s just “food I don’t usually get”, “extra food I wasn’t expecting”, or “food that is fun”. So, we shouldn’t think about rat treats in human terms. A rat treat food doesn’t need to be something unhealthy that we wouldn’t feed regularly. It just needs to be interesting. The following are my favourite treat foods for giving rats. These are the single most exciting treat in the existence of treats – according to the Horde anyway. The crucial part here is “in shells”. 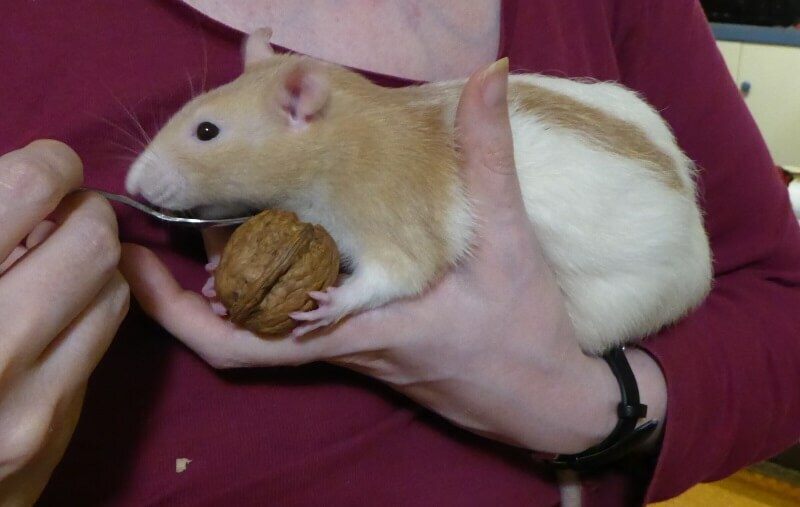 Rats love nuts in general as they are a natural source of calories, protein and fat, but if we remove the shells for them, then the rats don’t have to put any effort in, which raises the chance of over-eating, and deprives them of a chance to put those hard front teeth to good use. The only nuts I don’t tend to use are monkey nuts or peanuts, as the shells are quite soft so less fun. To up the engagement level, I often bury the nuts in the digging box or throw a handful across the free-range space for the rats to chase and find. Unlike cats and dogs, it is safe to feed rats cooked bones as they gnaw them to powder rather than crunching them up. Bones are a really important treat for rats as they form a crucial source of calcium. In the wild, rats will actively seek out bones from dead animals or rubbish dumps in order to chew them. So, these are a treat that rats not only can have, but should have. The rats will generally chew any meat off the bones first, then gnaw holes in the end and eat the nutritious marrow. Lastly they’ll eat the bone itself, sometimes over a few days. Any bones from cooked meat can be used, but I find chicken bones the easiest as you get plenty for your money. If you eat meat yourself then it’s fine to give the rats bones that have mostly been stripped of meat, with just a few scraps left on. As a vegetarian with a horde of 20+ rats (short version – I adopted a little rescue girl in need. Turned out she was carrying 13 tiny hitchhikers in her belly), I find the easiest thing to do is buy a small pack of free-range chicken wings, bake them and just feed them whole. I also tend to beg bones from non-veggie friends and family. I have been known to circulate social events at work with a tub, asking for the bones from anyone who’s hit the roast chicken legs or pork ribs on the buffet. It’s one way to start conversations. Do frozen peas get you excited? If yes, you may be a rat. Peas make a great rat-sized treat, but frozen peas have a hidden advantage – rats can go fishing for them. On a towel in your free-range area, put a wide shallow bowl filled with an inch or two of water. You need something that won’t tip up when a rat perches on the edge. I use a plastic cat litter tray and sometimes put a brick in the middle to both hold it in place and provide an island. Scatter a handful or two of frozen peas into the water. Release the rodents. Some will perch on the edge warily, some will launch straight in, but they’ll all have fun. Eggs – my rats get these weekly as part of their diet. I either feed them hard-boiled in the shell, or crack and beat the eggs, mix in some frozen veg and blast them in the microwave to make a ratty omelette. Broad beans – another perfect rat-sized snack. I buy packets of frozen beans from the supermarket and lightly cook a couple of handfuls to hand out. Whole corncobs or small squash – these are big treats, so on days I give them, I cut down on the amount of regular food given. Wholegrain bread – not something to give every day, but the occasional scrap of brown wholegrain bread is a fairly healthy food that rats love. Seeds – as above I prefer to give nuts in shells, but smaller foods such as pine nuts and pumpkin seeds make great treats for using in training and games. Of course, any loving rat owner is susceptible to the big eyes looking at you imploringly while you eat your dinner, and I’m no different. Bits of cooked pasta, rice, toast, cereal, fruit, potato and even pizza crust have found their way off my plate in the past. There’s no harm in giving rats the occasional bit of left-overs, or scraps off your plate as long as it’s not a daily thing, and the foods aren’t super unhealthy. Moderation is the key in both rat and human diets.